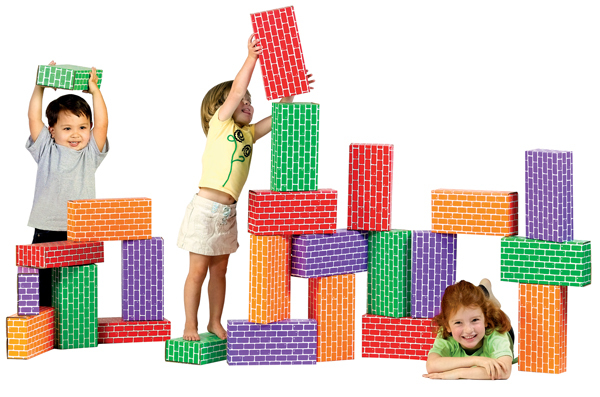 ImagiBRICKS Giant Building Blocks are an award-winning traditional toy beloved by generations. 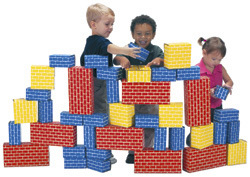 Because they are open-ended kidsG�' imaginations run high as they spend hours creating life-size structures. The blocks are strong enough to sit or stand on yet lightweight enough for even the smallest preschooler to carry and stack. The assorted sets contain 3 colors and 3 size unit blocks that help little builders practice mathematical skills as they add the number of blocks stacked on top of each other and the various-sized blocks can facilitate a conceptual understanding of fractions. 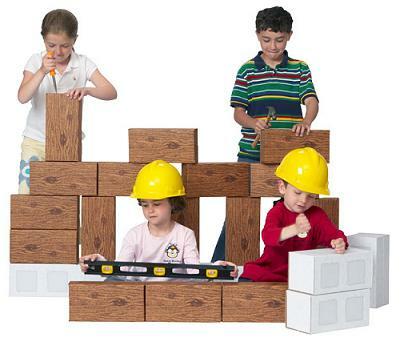 Made in the USA from 50% recycled cardboard the blocks have a smooth drool-resistant coating for easy clean ups. 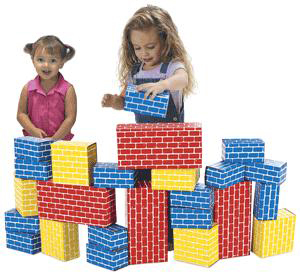 These durable blocks will be around for years of imaginative play.4 large red- 12 x 6 x 3 6 medium yellow- 6 x 6 x 3 & 14 small blue blocks- 6 x 3 x 3 For children 18 months and up Parenting Publications Award; Parenting Magazine Toy Hall of Fame; AblePlay 4-star rated for children with cognitive disabilities; Mom`s Best Award Winner. There's no greater feeling than getting the perfect item with the most features at the lowest price. 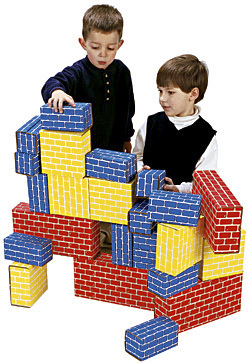 Our low price guarantee assures you that you are getting a competitive, low price on this great Smart Monkey Toys 1024 24pc Giant Building Block Set. This item is currently available for the everyday price of $25.02, a discount of 5% off the list price. UnbeatableSale.com offers domestic shipping options for your convenience and even ships to many international locations. We hope you will enjoy your shopping experience with UnbeatableSale.com. If you have any questions or comments, please see our contact page for information on how to reach us.